An nice hike in the Centennial Mountains, on the Idaho Montana border. Mount Jefferson is located in the Centennial Mountains, on the continental divide between Idaho and Montana. Jefferson is the highest peak in the Centennials, a small range just west of Yellowstone National Park. It also boasts over 3000 of prominence, so the summit views are very good. This is a scenic area, most easily accessed from a trailhead on the Idaho side, via Sawtell Mountain Road. After a surreal grizzly bear viewing hike to Francs Peak the prior day, Mount Jefferson was the final objective of our “Michael’s Awesome Peaks” road trip. Michael, John, and I had driven through Yellowstone after dark the night before, eventually finding a place to camp along Sawtell Peak road, and then rolling out the sleeping bags under the stars just before 1am. The next morning, we got up early, drove a few more miles up the road to the trailhead, grabbed our bear spray, and hit the trail. It was a nice morning, but we could tell it would be hot later. We made quick work of the first 2.5 miles of trail, with a few “Hey Bear” calls along the way. When the trail dropped north to Rock Creek Basin, we instead continued along the ridge toward Mount Jefferson. After leaving the trail, it was about 1.5 more miles in mostly easy and open terrain. We reached the summit about two hours after leaving the trailhead. Views were very nice, and we could even spot Hilgard Peak, where this trip had begun, eight days ago. Almost full circle. We enjoyed a snack on the summit, but home was calling after so many days on the road. We backtracked our path back to the trailhead, other than a side trip to “East Jefferson” (Peak 9500’), a lesser DDP summit not far from the trail. It was a short diversion with some pretty good views. Then back to the truck. Round trip for Jefferson was about 8 miles and 2400’ elevation gain in 4.5 hours. This was a really pretty area to take a hike. It was a nice way to finish up what had been a great week of mountain climbing. 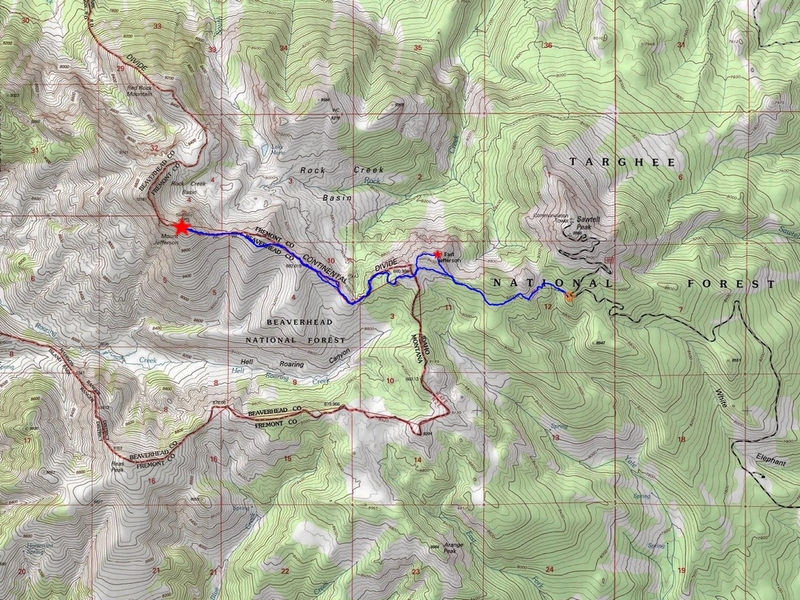 Map of the route, 8 miles and 2400' gain round trip. On the trail to Mount Jefferson. Great views from the trail. Open terrain after leaving the trail. Getting closer to Mount Jefferson. Nearing the summit of Mount Jefferson. View east toward Sawtell Peak, from Mount Jefferson. Mount Jefferson from "East Jefferson" (Peak 9500'). Map of the route, 8 miles and 2400' gain round trip.On the trail to Mount Jefferson.Great views from the trail.Open terrain after leaving the trail.Getting closer to Mount Jefferson.The final climb.Nearing the summit of Mount Jefferson.Mount Jefferson summit shot.View east toward Sawtell Peak, from Mount Jefferson.Mount Jefferson from "East Jefferson" (Peak 9500').